The real flavor of water refreshes and satisfies. 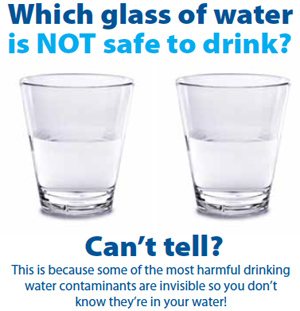 But today, enjoying a drink of water may not be as simple as filling your glass from the tap. Even when treated by an approved municipal water system, the goodness of water is often marred by minerals, organic matter or chlorine. Reverse Osmosis is a filtration process used for water. It works by using pressure to force a solution through a membrane, retaining the solute (dissolved solids) on one side and allowing the treated solvent (water) to pass to the other side. The membranes used for reverse osmosis water systems have a dense barrier designed to allow only water to pass through while preventing the passage of solutes (such as salt ions). This process requires that a high pressure be exerted on the high concentration side of the membrane. Contact us today. Harmful by-products formed during chlorination. Corrosion, which may damage appliances. Trace levels of unregulated contaminants, such as pharmaceuticals. and anyone who prefers a healthy lifestyle. cient. After all, 99 out of every 100 gallons of municipal water is used to water lawns, flush toilets, fight fires, wash clothing and automobiles, showering, brushing and a host of other external uses. Reverse osmosis drinking water systems come with quick change cartridges, NSF certified 50 GPD membrane, plastic storage tank, dedicated faucet, saddle valves and instructions. Okay… RO Is the best technology, but, Why The Water Doctor? 50 gallon per day NSF certified membrane for the best quality water possible! Advanced design, with easy to change twist-n-turn filter cartridges and membrane. Hinged bracket for easy access to replacement elements. No service calls simply to replace cartridges. Flow shuts off automatically when cartridges are removed. Polypro storage tank will not rust. Membrane is installed in a replaceable module, so change-out is sanitary. Pre-filtration with activated carbon to remove Chlorine, tastes, odors and other chemicals. 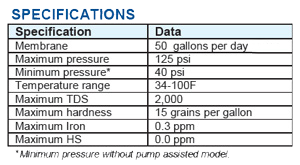 Waterite’s new Vectapure 360 series of filtration products is an advanced Technology Class of its own. 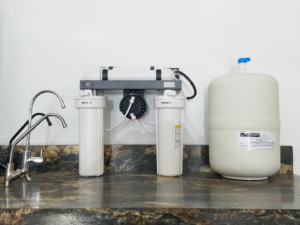 The V360 Reverse Osmosis System is a compact, under-sink residential drinking water system that combines the ease of a quick-change coulor-coded cartridges, with an impressive 75 gallon (285 liter) per day output. Each system includes all the installation hardware required for easy installation and a space-saving corrosion free storage tank. Pure, refreshing drinking water is always at your fingertips. The entire family of Vectapure 360 systems share effortless quarter-turn filter cartridges that change in seconds without the need to turn off the water supply! Each Cartridge is color-coded for easy and trouble-free selection and installation. Cartridges range from sediment reduction, taste and odor reduction, chlorine reduction and a .01 micron ultrafiltration membrane, right through to a unique reverse osmosis membrane. Vectapure 360 single or double filter systems are ideally suited for commercial food-service and beverage equipment applications. They are a quality alternative to other commercial filters, combining precise filtration and value to protect vital equipment and to keep business operating costs low . Perfect for coffee and espresso machines, ice makers, juice machines or other appliances that are supplied from a tap water source. The Water Doctor provides reverse osmosis water purification systems to DeBary, Osteen, Sanford, Ormond Beach, DeLand, Deltona, and beyond. 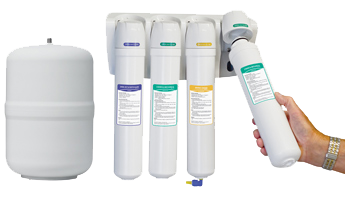 To inquire about a reverse osmosis water purification system, please contact The Water Doctor at 1-386-985-9960.